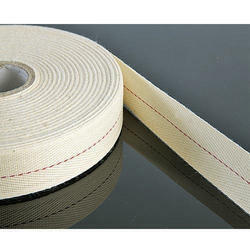 Our range of products include cotton tape. With an aim to stand tall on the expectations of our esteemed clients, we are offering a broad range of Cotton Tape that is used for home furnishing, bedding, and furniture upholstery. The offered tape is designed using superior quality fiber and the latest technology in adherence to industry norms. Our provided tape is available in various thickness, length, and colors for our clients. Moreover, this tape is highly appreciated in the market for its different quality features.